Police said this is the 11th traffic fatality of 2016. A driver in a silver truck died early Friday morning after colliding with a Dodge Durango in San Jose's Cambrian district, police said. 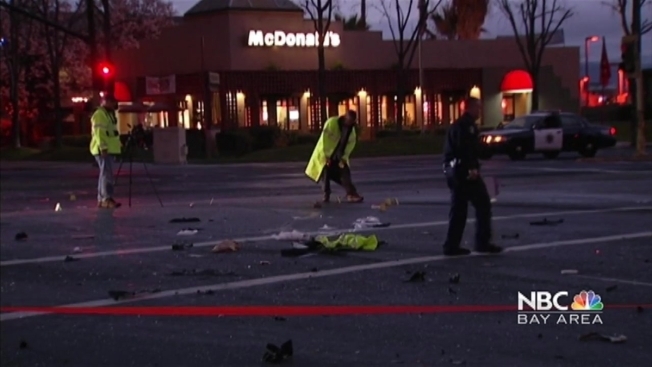 San Jose police said the accident was reported just before 3 a.m. at Camden and Leigh avenues, near a Chase bank and McDonald's. The driver of the truck died, and someone inside the red Durango, which ended up on the grass, was arrested, though police didn't immediately release more details. A friend of the truck driver showed up at the scene later in the morning. "It's pretty tough to know that he's gone," David Lowe said. The wreck was cleared and roads opened about 9 a.m.
Police officer Albert Morales said this is the 11th traffic fatality of 2016, and the driver is the 12th person to die in one this year.